All feet can have problems, even a child. In Claremore, as in everywhere, we have our children involved in many different activities and sports. Whether it be soccer, gymanastics, football, or dance, our kids’ feet are at risk for injury. Who is the best doctor to see your child about the foot issues? 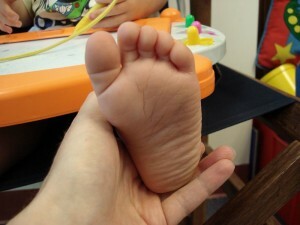 Your Claremore Podiatrist is an expert on the structure and function of your child’s foot and should be your first stop. The developing child often can have a variety of different foot problems depending on their age, heredity, and activity. The most important thing to remember is that no child should have foot, ankle, leg, knee, hip, or back pain. A child is not merely a small adult and there is no normal pain for a child. If your child is complaining of a persistent pain, you should take him to a doctor for evaluation. The most common foot problems for a child are ingrown toenails and plantar warts. Ingrown toenails most often occur because of improper cutting of nails and shoes that are too small due to a sudden growth spurt. Some children, however are just prone to ingrown toenails. These begin as discomfort around the toenails but can quickly become infected. Plantar warts are due to a virus that enters the system. Children are especially prone because the hydration of the skin is a environment that helps the wart thrive. Like any virus, there is no medication that is effective in eliminating them. While over-the-counter medications are very slow to work, if at all, we do have several remedies that are very effective. The most effective is treatment with a pulse-dye laser which provided no pain after treatment and allows children to continue all activity that same day. Young children present with some developmental issues of the lower extremity. The most obvious are children that “in-toe,” “out-toe,” and “toe walk.” These situations are easily noticed in young children because they are unable to compensate for these mechanical issues. While many pediatricians tell parents that the children will grow out of it, in reality they just become able to compensate and they become other problems as adolescents and adults, including foot and knee pain. In most cases, these issues can be easily and permanently managed with the use of orthotics for children. Time, however, is the most important factor for success. The earlier we can start treating a child with a positional problem, the more successful the treatment will be. Most children regularly participate in athletics, which can present new problems for them. The most common sports injury is an ankle sprain, which is an injury to the ligaments of the ankle due to the ankle being twisted. Ankle sprains must be treated immediately to be sure that the ligaments heal completely and in a stable position. Children in their preteen years can develop Sever’s disease, which causes pain in the back of the heel due to tension on the growth plate of the heel. Children in their teen years can develop Achilles tendonitis and plantar fasciitis just like an adult. Also, growing children are prone to stress fractures, as their bones are still immature and not at full strength. If your child participates in sports, or other activities such as dance, and has been complaining of pain or discomfort on a regular basis, be assured that we have everything at our disposal to assure a complete recovery and quick return to activity.